I read a good deal on a variety of subjects, especially Philosophy , Mathematics, Science, History and sometimes SF, my interest in which was revived by meeting Mary Gentle on cix, but I very rarely read anything that literary people would call 'literature'. I usually have several books on the go at any particular time and there is always a small pile of others awaiting attention. I have a fairly large garden and greatly enjoy pottering around in it. In the early 1970's I became very interested in board games and built up quite a collection, many of which turned out to be almost unplayable. Although I still have much of my original collection of games, the majority are now in the loft. One of the games was Go and that I have been playing on and off ever since. For several years The Leicester Go Club met weekly in my house. An intriguing aspect of Go is that, although computers have been programmed to be champions in many of what now seem to be called 'Mind Games', the best Go playing programs were until very recently little stronger than beginners. At various time I've talked to the Science group about Artifical Intelligence, Temperature, and CS Peirce and have put some of my material on this site. There are links on The box_room page. 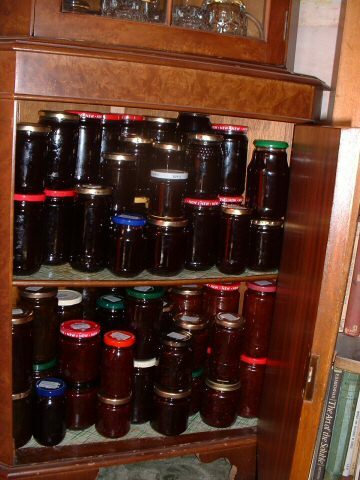 I quite enjoy cooking, and as well as cooking meals I also make lots of jams and jellies and marmalades, apart from the marmalade mostly made from home grown fruit. Recently I taught myself to make scones and biscuits. Although it would not normally be considered a hobby, having my house extended occupied a great deal of my time from the Summer of 2005 to the Spring of 2006, and even at the end of 2007 various tidying up operations were still under way. To save voluminous correspondence I've created an illustrated account of the adventure. Before email was even thought of, I'd developed quite a network of penfriends, some of them people who used to live near but then moved away, and some people I met through contact advertisements in magazines, the greatest number through an Atari ST user magazine. Now letters are written only rarely, and then usually in real wet ink as a special treat for the nostalgic, but I have quite a large circle of email friends, and also chat a lot on cix conferencing which has the great advantage that one can use an off-line reader. Very useful are some friends who work in computing, and can provide invaluable help in cyber crises, notably Gerard without whose advice this site would be even more primitive than it is, Leslie who provides me with a free reserve email address, and Philip who seems always to know the answer. In the 1980's, when I was proud owner of successively a Sinclair Spectrum, a Sinclair QL and an Atari ST, I should have cited computing as one of my interests but today when it is not owning a computer that makes one remarkable, it might be better to make the more modest claim that I don't take my computer entirely for granted, but take a moderate interest in its working and in the numerous strange files, most of them not put there by me, which despite their great number and in many cases considerable length, still don't come near to filling the hard disk. Nevertheless I encountered computers at such an early stage in their development that I shall allow myself a reminiscence. From time to time I try to learn something new, and in June 2011 struggled with the use of forms and cgi programming. The, rarely used, form on the visitors page of this site was created as a proof of principle. Towards the end of 2012 I started to teach myself more about interactive web sites and am learning a little about PHP programming to prepare myself for an encounter with the SQL database on the server. These days enthusiasts prefer the word 'Paranormal' to 'Supernatural', but I think the latter term gives the layman a better idea what is involved. Although I was quite enthusiastic about the subject in the 1980's, when I took part in several investigations in the Manchester area (I may still have somewhere a map of the haunted sites of Salford) in recent years I've done nothing about it except read the ocasional article, so it would be better described as an ex-hobby. However as people often ask me about it, I've put some anecdotes here.